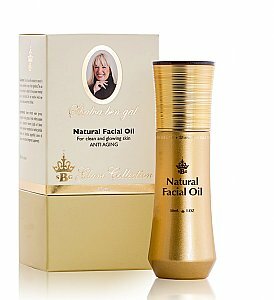 Gentle oil that provides the skin with glamour, nourishment and vitality, rich with vitamins found in lavender oil, with the addition of exotic and stimulating fragrances. Intended both for removing makeup and for nourishing the skin. Suits all types of skin. Wet a piece of cotton wool with hot water, apply a small portion ofoil, clean the skin, except the area around the eyes, with circular motions until complete absorption, then rinse the face with lukewarm water. The oil can also be used before putting on makeup: apply some drops of oil onto clean skin. The oil provides the skin with a glamourous and glowing appearance. Sweet almond water (prunus amygdalus dulcis) grape oil (vitis vinifera) sesame leaf oil (sesamum indicum) jojoba oil (buxus chinesis) geranium tocopherol oil vanilla planifolia lavender oil (lavandula angustifolia) carrot oil (daucus carota sativa) fragrance (supplement).